Do you still have March Madness fever? There is still a Buffalo team alive in the Big Dance. 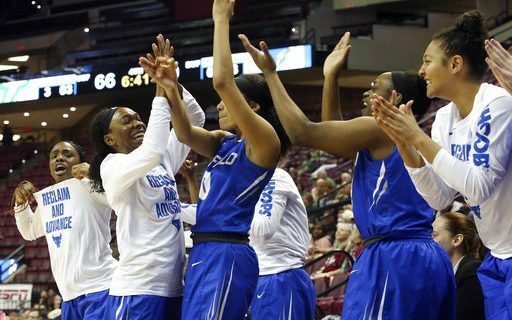 The UB Women play Monday, in the second round of the NCAA Women’s Tournament. They are in Tallahassee, FL to play the hometown Florida State Seminoles. The game tips at 6:30pm. It can be seen on ESPN2, the Watch ESPN App, and heard on ESPN 1520 radio in Buffalo. If you want to continue cheering on some hometown hoopness, but don’t know much about the Bulls, I’m here to help. The Bulls are 28-5. That’s school record for wins in a season. Three of those losses are to teams that are still alive in the NCAA Tournament. UB finished 16-2 in the MAC, and lost to Central Michigan in the MAC Championship Final. The Chippewas just beat LSU in the first round of the tournament. Point guard Stephanie Reid is the heart and soul of the Bulls. She is one of the best players to ever wear a UB uniform. Reid, from Australia, holds the school record for career assists and ranks in the top ten nationally in dishing out dimes. She is also a relentless defender. If Reid is the heart and soul, Cierra Dillard is the flash and dash. A Rochester native who transferred in from UMass, Dillard leads the team in scoring, three point shooting and celebrating. Her career-high 36 points in Saturday’s upset of 5th seed and 19th ranked South Florida had as much celebrating, strutting and smiling as it did shooting. Dillard is also one of the nation’s leaders in steals and that’s a big reason why the Bulls are one of the best teams in the nation at forcing turnovers. Hometown Buffalonians Cassie Oursler & Summer Hemphill provide rebounding and scoring from the low post. Down Under defender Katherine Ups does the dirty work. Fellow Aussie mate Courtney Ups hit five three’s off the bench in the win over the other Bulls. The Bulls like to run and score. They topped 80 points 17 times, a school record. The 102 points they scored against South Florida was the first time a double-digit seed topped the century mark in the NCAA’s. 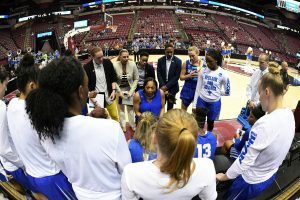 The only teams to top 100 in the first round were Connecticut, Tennessee…and UB. The Bulls hammered the 19th ranked USF Bulls. Now, it’s the 11th ranked Seminoles. The game will be played on FSU’s home court. The ‘Noles are making their 13th NCAA Tournament appearance in the last 14 years, and are going for their 3rd straight trip to the Sweet 16. They average over 80 points a game, and they’re one of the top rebounding teams in the nation. Leading scorer Shakayla Thomas will be playing in her 13th NCAA Tournament game. It’s certainly going to help if the Bulls shoot 53% again like they did Saturday. Another 51% effort from three point distance will also go along way to another upset. Becuase FSU is so good down low and rebounding, Oursler & Hemphill will need to have very good games. If Dillard can dazzle again, and Reid is the best player on both ends of the court, the Bulls can certainly send the crowd home disappointed. The Bulls play with so much heart and desire, they always have a chance to win. Sure, they’ll have to overcome a team that’s bigger, faster and stronger. But haven’t we seen that happen throughout the NCAA Tournament, especially from the other UB team.